This smoothie is berry delicious. Not to mention a nutritional powerhouse. First: let’s talk about the giant green spot in the pic – let’s just get it over with, shall we?! I was in a hurry (per usual), and it wasn’t until I went to edit the pic that I realized when I poured my smoothie into a glass, it took some of the blender splatter with it. This smoothie is one of my go-to smoothies because it’s packed full of nutrition AND it’s delish. 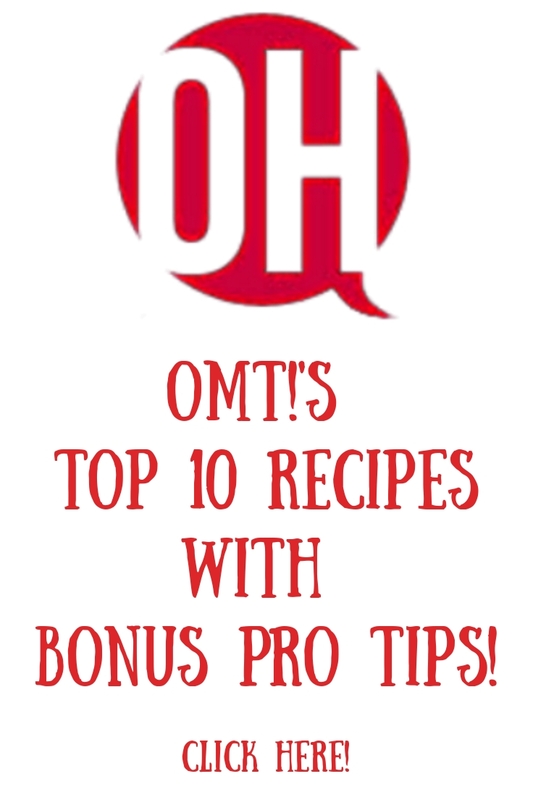 ‘Cause let’s get on thing abundantly clear – if it no tasty good, OMT! ain’t gonna eat it. Typically, when I’m in a hurry at lunch (almost ever’day), I just start grabbing ingredients at hand and hoping it comes out tasty. I usually win at that game, mostly because the only thing that still weirds me out a bit, is putting greens in my smoothie. 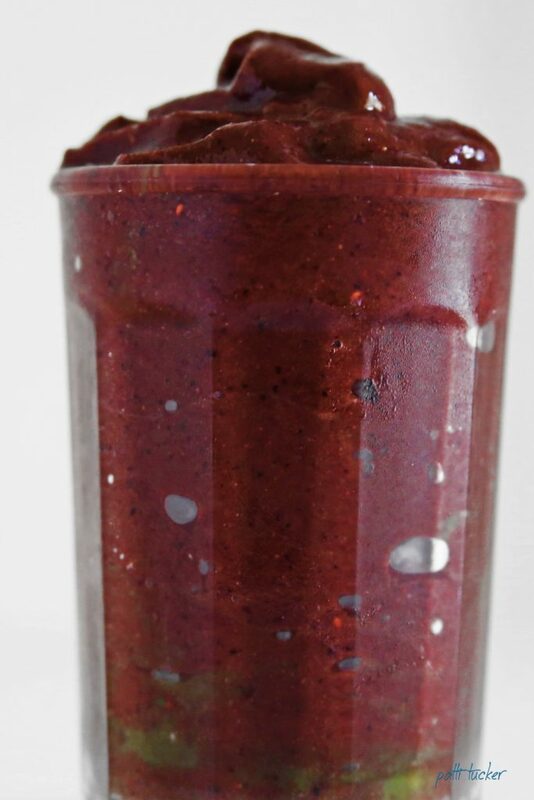 This glass of berry yum has roughly 7 servings of the 9 fruits and veggies you should get per day…in one yummy smoothie! Man, I love when things work on more than one level. 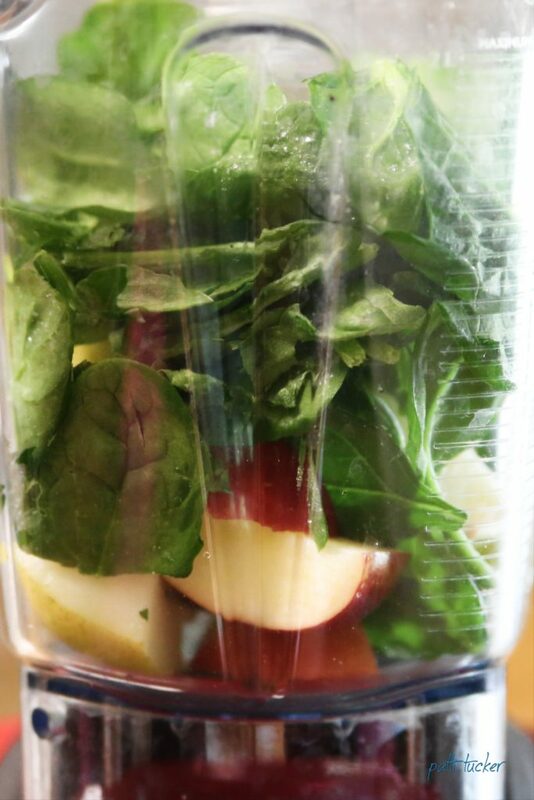 Place cut up apple, pear and spinach into mixer with enough of the water to get things mixing. Once very smooth (you can add more water as needed), add frozen berries. Blend until smooth, continuing to add enough water to keep blending. Lastly, add frozen pineapple and blend until smooth. Consistency will be almost like a sorbet, or, if you prefer more water, like a fancy frozen drink. ~ You CAN’T taste the spinach. If you could, I’d never drink it. ~ Adding greens is the easiest way to bump up your veggie intake for day. ~ You’re gonna feel smug after drinking. It’s only lunchtime and you’ve gotten in 7 outta your 9 reqs for the day. Smuggy McGee, that’s us. Should you want to photograph, wipe the edges of the blender down before pouring ~or~ spoon out into glass. Don’t be a lazy lazerton like OMT! That’s how to get your berry smoothie on. This looks DELISH. Can’t wait to try! 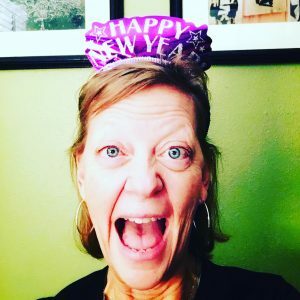 I love it – hope you do too! Yup! I’m in love with this! I will have to give this a try ASAP! Thanks for sharing at the Make Life Pretty Monday link party! Hope to see you next week! We love berries and smoothie, and even all of the fruits and veggies that go in the smoothies. Thank you for sharing at Wonderful Wednesday. I had one of these yesterday for lunch. Delicious and healthy!